DESCRIPTION ***ABSOLUTELY BEAUTIFUL 3829 SQ. FT [DEVELOPED] CUSTOM BUILT HOME. THE 55 FOOT WIDE LOT ALLOWS FOR AN EYE POPPING FRONT EXPOSURE, SIDEYARDS THAT ALLOW FOR FREEDOM OF MOVEMENT- FRONT TO REAR -AND A REAR YARD THAT HAS A TRIPLE DETACHED GARAGE AND ADDITIONAL ROOM TO PARK YOUR R.V. JUST A FEW FEATURES INCLUDE A 19 FOOT STONE FEATURE WALL, OPEN STAIRCASE TO UPPER AND LOWER LEVELS, A 10 X 5 QUARTZ ISLAND, UPGRADED APPLIANCE PACKAGE, A 13 FOOT WIDE 'NANA' FOLDING GLASS DOOR TO HEATED REAR DECK WITH ELECTRICALLY CONTROLLED SCREENS, 10 FOOT MAIN FLOOR CEILINGS, MAIN FLOOR FIREPLACE, TWO SIDED FIREPLACE IN 5PC ENSUITE SEEN FROM FREESTANDING TUB OR BEDROOM, EXTRA LARGE WALKIN CLOSET IN MASTER, LARGE WALKIN CLOSETS WITH ENSUITE BATHROOMS IN 2 UPPER LEVEL BEDROOMS, 2 MORE BEDROOMS ON LOWER LEVEL HAVE ACCESS TO A 3 PC BATH, MAINFLOOR FLEX ROOM WITH 'BARN' STYLE SLIDING DOOR CAN BE YOUR OFFICE. IN SUMMARY,MAIN FLOOR HAS FRONT FOYER, LIVING ROOM WITH FIREPLACE, DINING ROOM WITH ACCESS TO COVERED, HEATED, SCREENED DECK, KITCHEN WITH HUGE ISLAND, LOADS OF CABINETS AND PANTRY,REAR MUD ROOM WITH SECURITY ACTIVATOR. * UPPER FLOOR HAS MSTR BDRM WITH HUGE 5 PC BATH, TWO SIDED FIREPLACE AND LARGE WALK-IN CLOSET. 2 ADDITIONAL BEDROOMS, AND SPACIOUS LAUNDRY ROOM. * LOWER LEVEL HAS SURROUND SOUND GREAT ROOM, HEATED FLOOR, 2 BEDROOMS, 3PC BATH, MECHANICAL ROOM, WALL WINE RACK, BEVERAGE COOLER, STORAGE ROOMS. * 3 CAR DETACHED REAR ACCESS GARAGE IS INSULATED, DRYWALLED AND PAINTED WITH DOOR OPENERS AND CONTROLLS. *LANDSCAPING AND COMPLETION OF THE GROUNDS WILL BE SCHEDULED AS WEATHER PERMITS. Home for sale at 11 Laxton PL Sw Calgary, Alberts T3E 5E7. 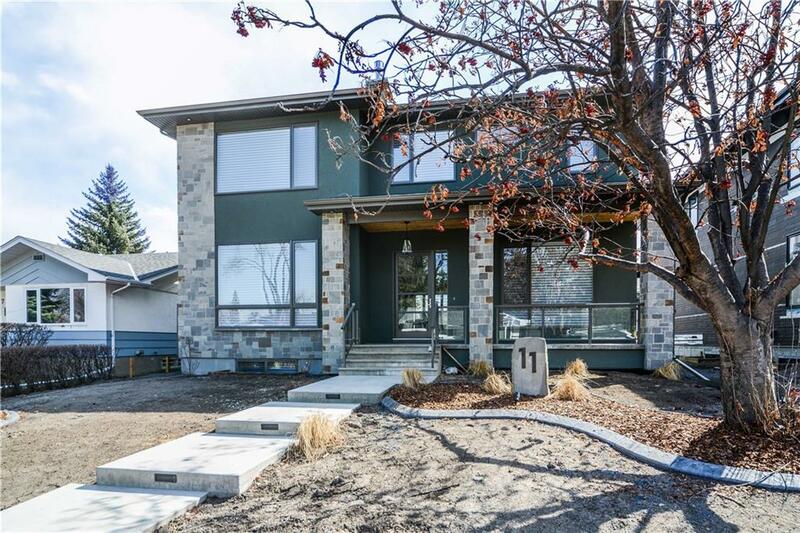 Description: The home at 11 Laxton PL Sw Calgary, Alberta T3E 5E7 with the MLS® Number C4224072 is currently listed at $1,790,000.